A feature of many wars down the ages is that they are initially fought using the tactics of the previous war, and by the middle of the 19th century this was very dangerous thanks to the rapidly improving weapons that industrialisation was bringing in large numbers. Even in the few years since the Mexican War the infantry firearm had improved, and the smoothbore musket gradually gave way to the percussion rifle, allowing infantry defending a position to pour ever more effective fire onto any assaulting troops. This dramatically reduced the effectiveness of the cavalry and artillery, but all too often it was still the job of the infantry to mount a frontal assault on a well-defended position, and the consequential casualties were sometimes horrific. Yet the spirit of energetic offence died hard, so such assaults remained a feature of many a civil war battlefield, and while there have been many civil war sets before, this is one of the first to concentrate solely on such costly assaults. The first thing to say about this set is also the most obvious; that most of the figures are basically in one pose, that of advancing with musket on the right shoulder. Attacking troops did sometimes fire on the defenders to keep their heads down and reduce their fire, but it soon became apparent that this did little to negate the tremendous advantage in fire that the defenders had. Sometimes assaulting troops were told not to fire, but to advance as quickly as possible to minimise their exposure before they reached the enemy, so it was simply a case of moving as quickly as possible while carrying the musket. All these figures have the bayonet fixed, so they are not expecting to fire but to reach the enemy very shortly. Yet none have the bayonet lowered, so clearly these men are still a little way off their objective. As an advancing pose this is fine, with all the little differences that make a group of such men look more natural. However every man has his right leg forward, which smacks of a formation in step, which would be unlikely in an attack. 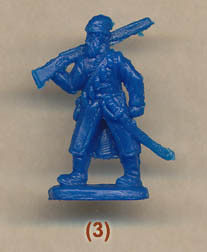 Having the musket on the right shoulder forces this particular leg arrangement for one-piece figures, but it does detract from the overall effect. The 12 attacking poses are joined by eight others (bottom two full rows) which provide some of the command figures and a bit more variety. We find a man lying on the ground and another also downed, while a third is perhaps suffering an injury. While such casualty poses are very necessary, given the circumstances of so many attacks, we were not particularly keen on the first of these. This man, flat out on the ground, has his arm in a stiff 'L' shape and his legs straight, and just does not look like he has fallen as the result of being hit. The man resting on one arm is excellent however, and very believable, being one of our favourites of the whole set. He seems to clutch at his thigh and is even seen to be shouting or screaming, as if in pain or calling for help. The third, who carries no weapon and seems to hold his abdomen as if just shot, has no sensation of movement. His back remains perfectly straight, so perhaps he is clutching at some wound but walking back for assistance, having abandoned his weapon. As such this is a perfectly useful pose, as there would have been many men retreating to the rear during a charge. The fourth man in this row is pointing at something and has chevrons on both upper sleeves, making him either a sergeant or corporal (hard to see exactly how many stripes). So he is the first of the command figures, and a pretty good pose too. Beneath him there is a decent bugler pose followed by a man carrying a flag. Finally we have two officers, both of which are identified by their uniform as being field grade officers, so Majors or above. Both have sword drawn (more for effect than likely to harm the enemy), with one having it held naturally at arm's length (a good choice) and the other with it pressed tightly against the right side of his face (not so good in our view). However while fine from the side, when viewed from the front the officer with lowered sword leans considerably to the left, and his feet are directly in line, so is much flatter and more awkward than he needed to be. Still all the poses are quite usable, and this is a good selection of 'extras' to add interest to the basic set. Although it did vary, the most common form of uniform worn in the field by the Union infantry was the 'sack coat', as depicted in many previous sets by other manufacturers. No one here wears this, however, as all the troops wear instead the single-breasted frock coat, which was certainly worn in the field in large numbers, but this distinguishes these troops from most that have gone before in this hobby. The frock coat had a standing collar, correctly done here, and was supposed to reach to mid-way between hip and knee, but most here are much longer, almost reaching the knee itself. Also there is no sign of any cuff on any coat, which is an error which painting can remedy. The trousers and shoes look fine (no one has gaiters or visible socks, which might have been nice but not essential), and all the privates wear the forage cap. While this is a great choice, here it has been sculpted with the top of the crown very far forward, often facing completely to the front, which is not backed up by any of the many photographs of such troops, which show the top tilted forward but not by this much. The two officers are distinguished in several ways, quite apart from the swords they carry. First they wear brimmed hats, which are not the dress 'Hardee' hats, but officers often wore slouch hats so that is no problem. Both have double-breasted frock coats which (correctly for officers) do reach the knee, and the double-breasted feature means we can identify their senior rank as above. They have shoulder straps but no epaulettes (rarely worn in the field, so good), and both wear a sash (also fairly rare, but not wrong). Both also wear gauntlets, which is interesting, and both have furnished themselves with a revolver on their belt. Finally one seems to wear long riding boots, so perhaps is normally mounted. Moving to the equipment, each man has much the same, which is a cartridge pouch suspended by a belt over the left shoulder and a haversack slung over the right shoulder. No one wears a knapsack, which was often discarded prior to an assault, and there are no cups attached to the haversack, which was common but by no means universal. More problematic are the water bottles or canteens, which in all cases sit in the small of the back between haversack and pouch when they would actually sit over the haversack. This they cannot do as all are held by a strap over the left shoulder when it should be over the right, so this seems like an error introduced to make the sculpting easier. Everyone has the cap pouch on the right of their waist belt, but despite everyone having a bayonet fixed there is no sign of a bayonet scabbard on anyone (it should be under the haversack). The bugler has no weapon and so no cartridge pouch, which is fine (and incidentally has no braid on his frock coat, which was common but again not universal). Weapons all look to be any of the popular types of musket, but detail is not good enough to make absolute identifications. Suffice to say they all look OK and could serve as any of several models. The sculpting is good. Now compared to previous Strelets output that is a big step forward, as these figures have none of the chunky and at times quite crude appearance of some much earlier output. This should make them much more compatible with other manufacturers, which is great, but it is not all good news. While a big improvement, detail is still only good and not great. So for example the muskets are quite basic and have no slings (not a problem) and also no lock or trigger (a much bigger problem if you wanted to fire them). Also the advancing figures are all fairly flat - we have seen much worse, but in particular all feet are in direct line behind each other, so all are quite awkward when not viewed from the side like our photos. We quite liked the faces, particularly of the two officers that sport a moustache and a full beard on one. Also the 'dead' man does not lie comfortably. He is equally detailed on both sides, but if placed face up then his legs do not touch the ground and if placed face down then his left arm is up in the air. We appreciate the choice, but perhaps it is better to decide on the exact position and sculpt to that. A special note goes to the standard bearer, or rather to his important burden. Infantry flags of the day were roughly 1.8 metres on the hoist (i.e. high) and almost two metres on the fly (i.e. wide). As you can see, in this set it is nothing like that. In fact it is only about half the required measurement in each direction, so the flag itself is just a quarter of the proper size, though of roughly the correct proportions. There is no getting away from the fact that this flag looks really puny, although the pike is about the right length, or would be if it had a finial at the top, which, sadly, it does not. There is no design engraved on the flag, which meets with our approval, and it has some basic curve which makes it look fairly natural. The bearer himself should be a sergeant, but has no pistol or sign of rank, so perhaps is just an infantryman that has picked up a fallen flag, as often happened. For a relatively simple set there has been a lot to say. Although the frock coat is valid in battle, perhaps a mix of frocks and sack coats would have been preferable. The caps are not particularly well done, and some of the kit has also been messed with too much to our eye. Proportions and sculpting is good but not up with the best, and the poses are OK but a bit flat. Finally the flag is really quite poor, but there is a good range of 'extra' poses - command and casualties. When considering accuracy you must remember there were some militias who followed their own rules, at least initially, but for us this is a fair set that is a big improvement on past output but still with room to improve.